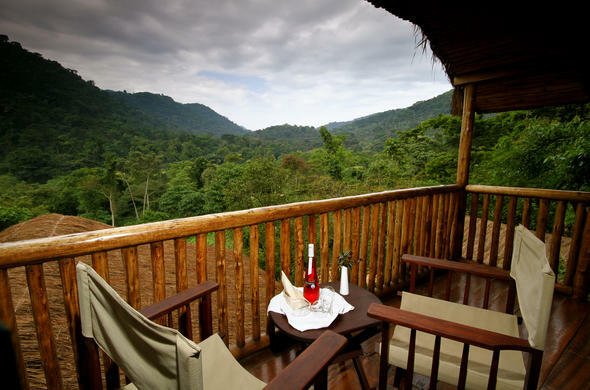 The cottages and central guest areas of Buhoma Lodge all have commanding and uninterrupted views of the Bwindi Impenetrable Forest National Park in Uganda. Buhoma Lodge is situated within the Bwindi Impenetrable Forest National Park in Uganda, less than five minutes walk from the start of the Gorilla Trekking point. Guests can fly-in to an airstrip nearby or self drive to the lodge. Uganda has a temperate climate all year round, 25 – 30 degrees Celsius (77 – 86 degrees Fahrenheit) during the day and 5 – 10 degrees Celsius (41 – 50 degrees Fahrenheit) at night. Evenings at Bwindi can be chilly primarily due to the high altitude. The nearest airstrip for charter flights is Kayonza airstrip, which is a 50 minute drive from Buhoma Lodge. Bwindi Impenetrable Forest National Park in Uganda is a full day’s drive from Entebbe or Kampala, 6 hours drive from Lake Mburo National Park, and 2 hours drive from Queen Elizabeth National Park (Ishasha Sector). Buhoma Lodge guests can visit the neighbouring orphanage and school as well as a vegetable farming project where local meals can be prepared and enjoyed.